What is the measure of a mans heart? How do we go about finding out? 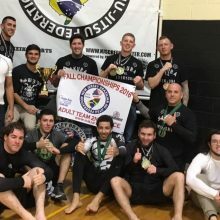 As of very recently my students at Sakura BJJ have taken a bigger interest in competing. At first this made me very nervous as an instructor and mentor. How was I to soften the blow of losing? No one likes to lose. We can say all day that you win or you learn but that doesn’t lessen the sting of another man standing over you in victory in a sport where as Joe Rogan says, “We are practicing killing each other.” That is the brutal truth. Losing can make someone lose all interest in what is really important which is the training itself. It got me thinking. I would like to share how i have been explaining taking on the task of competing in combat sports. I have narrowed it down to one very simple question you can ask your self when it is all said and done. Did I prove my point? It is IMPOSSIBLE to measure yourself within certain rule sets and variables. I myself have had incredible performances where I dominated a fight for 5 minutes but lost on an advantage or some silly technicality or ref decision. I have lost matches on bad calls and curious positional resets. I have had my hand raised in Bare knuckle combat forcing my opponent to tap but suffering a broken face. I am often left wondering after these contests if I really won or really lost. How can you tell? Just yesterday we secured a second place team trophy at the NJBJJF. We brought 12 students who consistently and convincingly were winning gold medals in multiple divisions with no points scored and a few winning in under a minute. We were runner up to a school that has a long standing academy with hundreds of students with many participants entered to compete. Should that scenario of winning second have any bearing on what we accomplished that day? ABSOLUTELY NOT. Neither should the losses we took. It means nothing. Maybe your point was to just go and compete for the first time. That can be very scary for someone and a huge accomplishment. Or perhaps your point was to just win the first match, nothing more nothing less. Proving your point can be to just get on the podium as a bronze medalist. It can be as small of a point of making weight to as big as becoming a world champion. Competition should not define you. It is nothing more than another tool we use to become who we would ultimately like to be In life. In the grand scheme of things. I love Jiu Jitsu more than anyone I know. It is my religion. However I am also a dad, a husband, a friend, a mentor, a business owner, and many other things. Jiu Jitsu as well as all of these things together make Chris Civello. All the experiences from each help guide me on my path. So next time you take a “loss” or a “win” ask your self if you proved your point. Learn from that place with no pressure of an idea someone else had of what “Jiu Jitsu Prestige” is. Know that there are people that don’t compete that can crush peak world champion athletes. (My teacher Marcelo Garcia for example.) Know that you can face tougher opponents at a local tournament than you maybe would at the worlds. It depends on who show up. Know that you stepped on the mat that day to do what you love and that is often a victory in itself. Know that there are too many variables to measure yourself against.